Thank you to everyone who wished me luck and sent good thoughts my way! I really appreciate it! Well…. (drum roll, please)…Today went fine. I had an all day training session for my new job and I was nervous about it and about my new job that starts August 17. (I wrote a post about it this morning). All in all, I feel better. I’m NOT the only one who feels lost and overwhelmed; others taking the training today felt the same way. The scariest part of my job is not knowing exactly what is to be done. I like to know exactly what is to be done, but this job is a little different because I will wear many “hats”. I’m a liaison person; I will be helping various groups of people and bridging the gap between them and the bosses. There are several components to the job, and I will need to address the needs of my people as I see fit. Sometimes I will be training groups of people in new procedures. At times I have to model correct techniques because I am now considered the “expert”. That’s damn scary! I have never felt like an expert at anything I do! Hope you all, my dear friends, have a great day! Today I felt completely overwhelmed. I decided to go work a little in my office at my new job (it officially starts August 17). I have stacks of papers, books, and other materials left by the former employee that I am responsible for sorting and organizing. My job is to have it ready for the other employees as they need it. It was a total mess! The previous employee became sick and had been out for almost a year, and it was obvious that others had come and borrowed materials, never bothering to return things to its proper place. Plus, I had my boxes from my last job in storage that I had to move to my new office. Right now the room looks like an episode of “Hoarders” gone wild! What I wanted to do is sit down and cry. Since that would only serve to make the books and papers damp (and who wants damp books and papers?) I decided to do the only thing I know to do: take pictures and plan. First, I moved everything that I needed into the room. As I did, I grouped like objects together. I then grabbed my camera and took pictures of every stack and every piece of furniture. 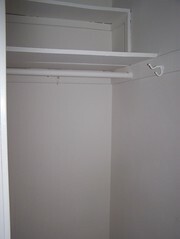 I made sure to include pictures of the walls and built-in cabinets as well. After taking the pictures, I turned out the light and walked out. Being there without a plan made me anxious and I knew I would not be productive. Now that I am home, I can use the pictures to figure out the best way to organize the piles of materials. I feel much calmer now that I have a plan of action! Oh, also, I did something else productive yesterday….I completly cleaned and organized my walk-in closet (Which, by the way, WOULD have qualified me for “Hoarders”). Yea, me! It feels so good to have that done. I threw out tons of stuff I haven’t worn in years, and I have a huge pile to give to charity. I like things clean and well-organized, so this makes me feel very happy! My mind is in a permanent state of chaos. It is so easy to sit here and say, ” I need to do A, B, and C. If I do these things, I will have less to worry about and less stress.” But I cannot seem to be able to make myself do A, B, or C! Everything, even semi-small tasks, seems too overwhelming. I know this will pass, but it upsets me that I waste so much of my life. I am trying to take baby steps. I went to my new job today and spent some time sorting the boxes in my office. The former employee left boxes and boxes of supplies and materials and it is my job to sort it…before I move my own belongings in. It is extremely hot here (again) today, and the air conditioner was not on, so I didn’t stay long. It felt good to have something accomplished and to get out of the house. Baby steps, right? Now I am back home with several hours before bed. I still need to make supper (something quick and easy, I think; it’s too hot for anything elaborate), but I have time to do something else. Maybe I will call my mom just to say hello. Then, I could clean just one shelf in my closet. One shelf wouldn’t be so bad, would it? If I do that, maybe, just maybe, the chaos in my mind would not be so bad tonight. Flowers, but especially daisies; they are such happy flowers! A clean kitchen sink…weird, I know, but it makes me happy! Old buildings…they have such history! but my heart remained filled with doubt. So I’ll just sit down here and cry. I’ve roamed so very far away. there’s got to be something more. ’til it all makes sense to me. You were the first man in my life. The good news is you gave me the love and security a young girl needs from her daddy. The bad news is you set the standard high; no other man could ever measure up to you. My best memories are times you and I spent doing simple things together. I loved the smell of your workshop, and my favorite thing to do was bang around in it. Remember how you used to let me use your soldering iron? I would create mini metal sculptures. You worked on a project while I played around at the workbench; those are great memories, Daddy. I also remember sounding out a word to you. I was so proud because I had just learned the magic of unlocking the meaning of the sounds of each letter. We were outside a shopping center, waiting for mom to go through the check out line, and I saw the word written on the wall…..F…..U…..C….K….hmmmm….”What does that mean, Daddy?” Your reaction was confusing, but priceless! I have a secret to tell you. Remember when I was about 9 years old and I started joining you and your buddies when you steamed oysters? The men would sit around drinking beer and swapping stories, and I would hover around the edges. When the oysters where ready, we would take the knives and shuck open the gritty shells. Inside would be the salty, chewy prize that would slide down my throat. My secret is…..I didn’t really like oysters. I simply ate them to spend time with you. You were my wonderful sanctuary from my negative, over-protective mother. I know she meant well, but…well; you know. You lived with her, too. Remember when I was a teenager and having a really tough time with drugs? You took me to the pier at the ocean to fish. It was the first time we spent alone together since I was a small child. I don’t remember what we talked about, but I remember being so happy to be with you. You were always my Superman, even when I was a lost soul. You stood by me, Daddy, when I was going through some tough times. You saw me through bad relationships, heavy drinking and drugs, and other assorted tragedies. Even now, when I am a grown-up mother of two adult children, dealing with problems you’d never even heard of, you stand by me. I can always count on my daddy to be the one man in my life who never lets me down.